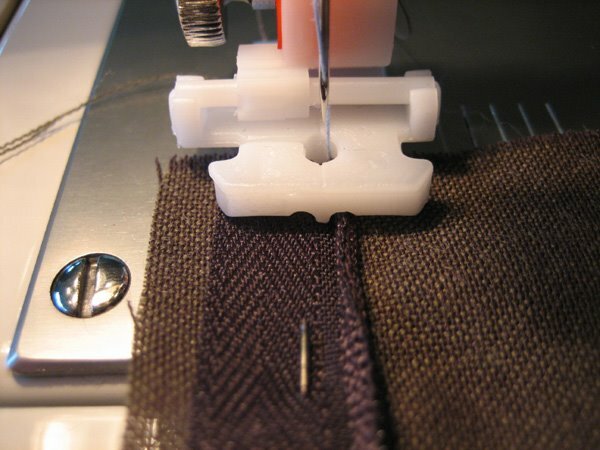 VERY IMPORTANT: An invisible zipper is inserted before your seam is sewn. Your pattern instructions will likely tell you to sew the seam up to the point where the zipper will begin. Don't sew the seam, instead follow the directions below for an invisible zipper. 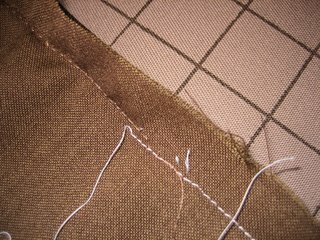 To sew an invisible zipper, you will need (l-r): an invisible zipper foot, an invisible zipper, and your cut fabric pattern pieces. 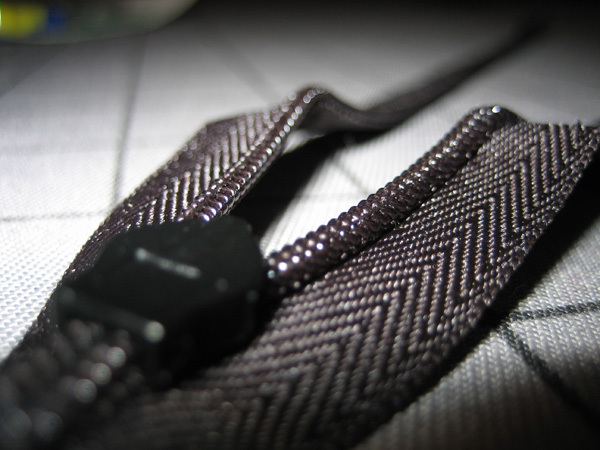 Invisible zippers do not come in as many colors as regular zippers, however, because they are invisible, matching the zipper to the fabric exactly is not critical. When the zipper is closed, you will only see the small zipper pull. Choose the color zipper that has a zipper pull which best coordinates with your fabric. When you remove the zipper from its package and unzip it, the zipper teeth will form a ridge on the back side of the zipper, as shown below. 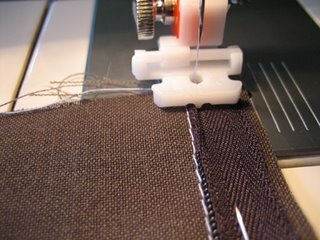 Before sewing the zipper, it must be ironed so that the back of the zipper is flat, and the ridge of the teeth is on the front side of the zipper. 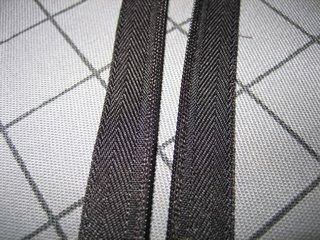 The picture below is the back side of the zipper after it has been ironed. 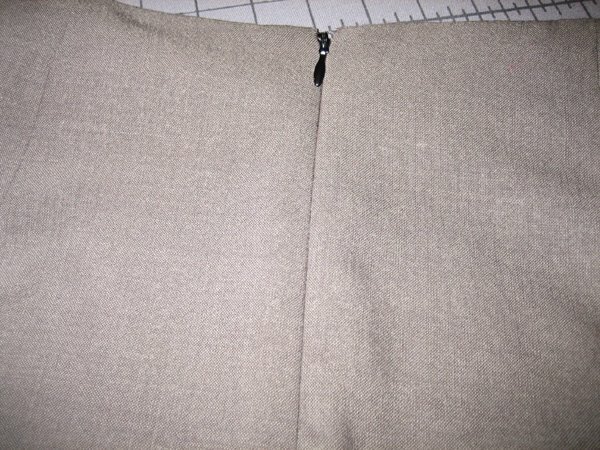 As you can see, it is nice and flat, and you can see the rows of stitching next to the zipper teeth. Next, you will need to prepare your fabric so you can line up the zipper properly when you sew it. The teeth of the zipper must be exactly lined up with your 5/8" seam allowance. 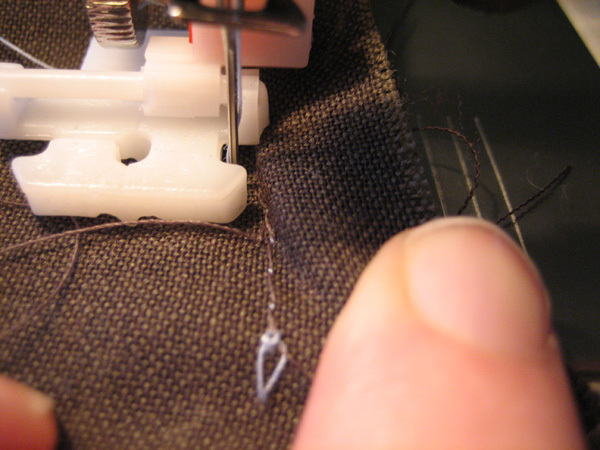 To mark the seam allowance, you can machine baste along the seam allowance using contrasting thread, as shown below. 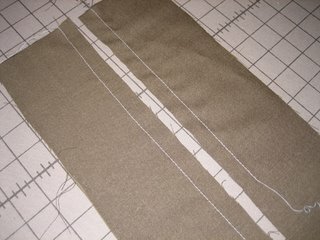 If you do not want to baste, you can also iron the seam allowance to form a fold, or you can use dressmakers chalk or a fabric pen to mark the seam allowance. In order to install an invisible zipper, you MUST use an invisible zipper foot. 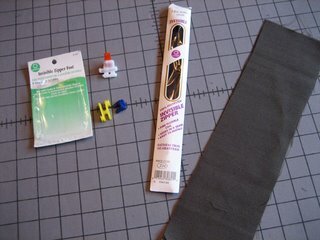 When I purchased my zipper foot for this project, I could only find a cheap (~$3), plastic zipper foot from Coats & Clark. Figuring out the zipper foot caused me more trouble than any other part of the zipper project. The zipper foot came out of the package in four pieces - white, red, yellow, and blue. 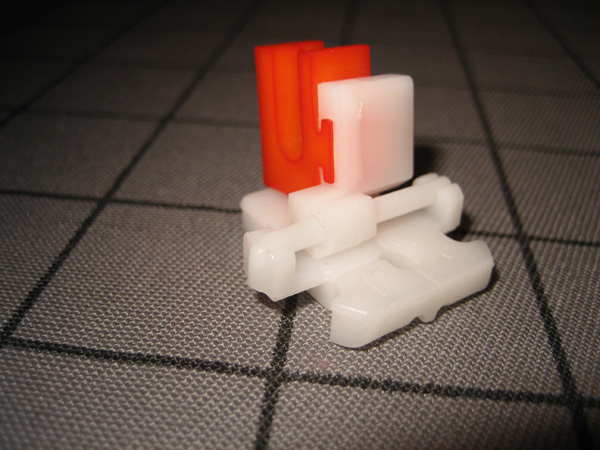 The white piece is the foot itself, and the other colored pieces are interchangeable parts that allow you to attach the foot to different types of sewing machines. It took me a long time to figure out which interchangeable colored plastic piece to use for my machine. 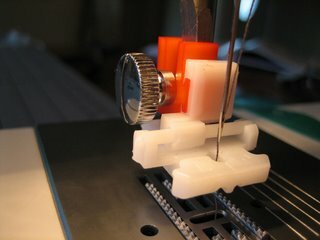 Finally, I determined that I had to remove the foot from my machine, and measure the distance from the center of the foot screw (at 2" below) and the center of the needle (at 1.5"). Because this distance is 1/2", I determined that my sewing machine required the red plastic attachment for the foot. Hopefully you can tell from the picture below how the foot is attached. Once you have the foot assembled correctly, it works just like any other foot attachment. Here is a front view of the foot. You can see there are two grooves in the front of the foot. 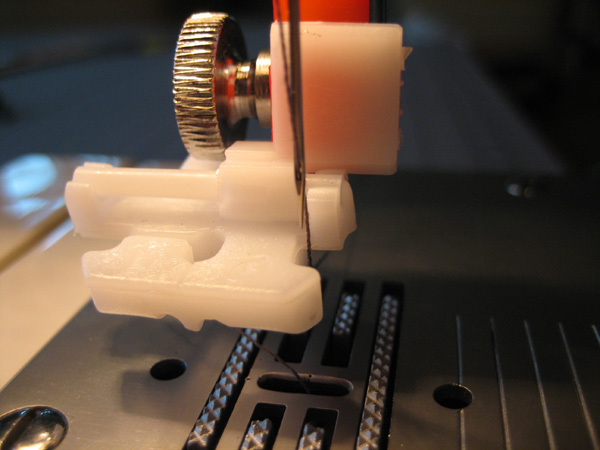 These grooves help to guide the zipper teeth for the right and left side of the zipper. Also note that the bottom part of the foot slides along a horizontal bar. Be sure you have your needle lined up with the hole in the center of the foot before you begin, or you may break your needle. 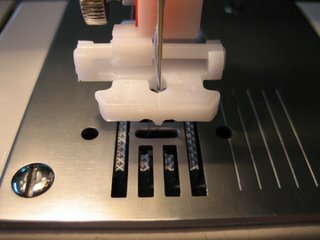 Your invisible zipper foot may look slightly different from this one, and may be attached to your machine differently. However, it will have the same grooves, and will operate in the same manner. Open the zipper completely. 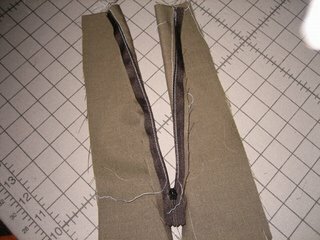 Pin the right half of the zipper to the right piece of your fabric. The top of the zipper (where the teeth end) should be 3/4" from the top of the fabric. For the particular zipper that I was using, this meant that the top of the zipper tape exactly matched up with the top of my fabric. Start at the top of the zipper, and with the right side of your zipper (face down) facing the right side of your fabric (face up), pin the zipper tape to the seam allowance, being careful to place the edge of the zipper teeth exactly along the basted or marked seamline. Start sewing at the top of the zipper. Lower the presser foot, placing the ridge of the zipper (the teeth) under the right groove of the foot. Now you are ready to sew! 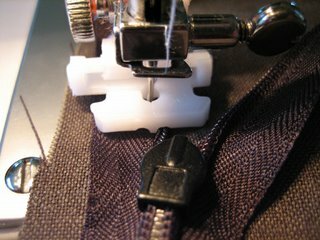 Sew along the length of the zipper, removing pins as you come to them, and keeping the teeth of the zipper lined up with the seam line. 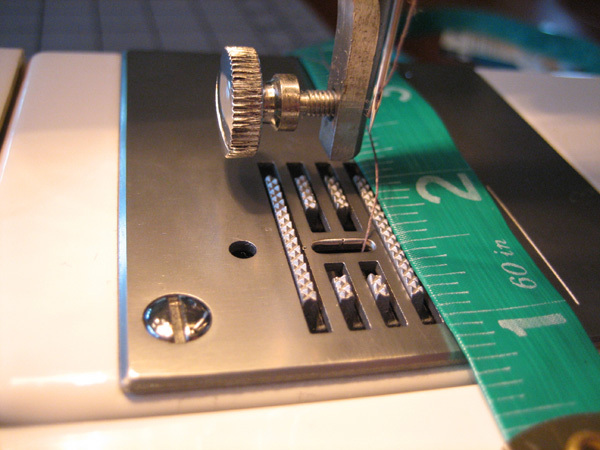 Stop sewing when you get to the zipper pull and cannot sew any further. 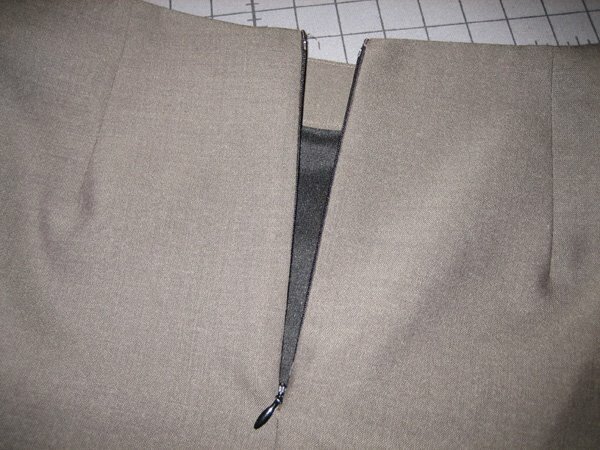 Next, you will sew the left half of the zipper to the left side of your fabric. Line up the top of the zipper and top of your fabric, as for the right side, leaving 3/4" between the top of the zipper and the top of your fabric. 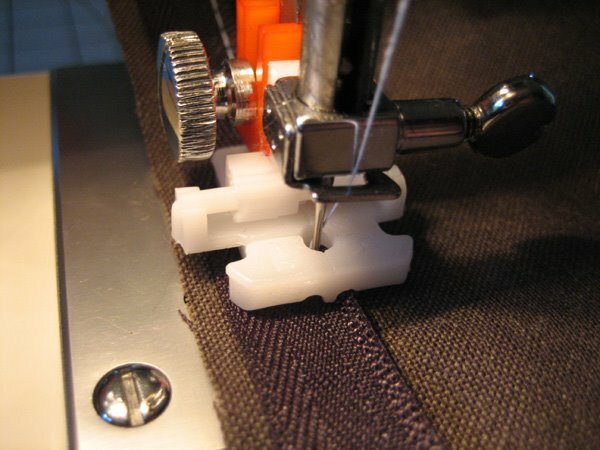 Lower the presser foot onto the zipper, with the left groove of the foot over the zipper ridge. Sew along the zipper, removing pins as you come to them. Be sure to keep the edge of the zipper teeth lined up with your marked seamline. Stop sewing when you get to the zipper tab. Voila - your zipper is sewn in! The only step remaining is to finish sewing the seam. **Note that while I have not done so, you may choose to baste your zipper in place before sewing it. If you are using the Coats & Clark invisible zipper foot, or a similar zipper foot, you will need to reposition the foot in order to finish the seam. Slide the foot all the way to the left, so that the needle is positioned in the small groove on the right side of the foot. You may also choose to use a regular zipper foot for this part of the seam. Here is the finished seam. 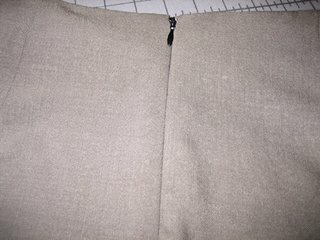 You can see the zipper stitching in brown, and the seam stitching in light blue. 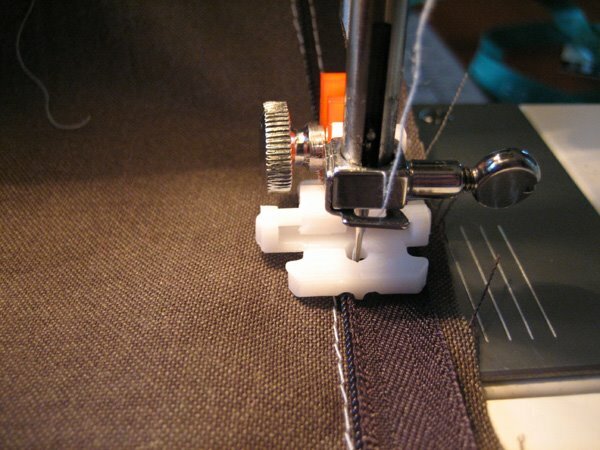 The zipper and seam stitching won't match up exactly, but your goal is to get them as close as possible so as to avoid any gaping or bunching on the right side of your fabric at the bottom of the zipper. After you've sewn the seam, you may also want to stitch the bottom ends of the zipper tape to the seam allowance to keep them laying flat.